What’s a color conscious car like the Chevy Spark going to do to build a name around the country? How about being the pace car for The Color Run, a series of 5K races featuring runners fit to be dyed! After all, the Spark comes in eclectic colors such as Jalapeno, Salsa Red, Lemonade, Denim Blue and Techno Pink which will fit right in at the front of 10,000 runners who are doused from head to toe in a different color for each kilometer. The first such event comes this weekend at the Aviator Sports Park in Brooklyn. Chevrolet and The Color Run have just announced a sponsorship agreement designating the Spark the official vehicle and pace car for the 5K through 2013. Participation in the popular race is booming since its 2011 introduction, with nearly a half-million "likes" on Facebook. "The Spark and The Color Run are perfect running mates because both appeal to style-conscious, high-energy urbanites who don't live life in neutral," said Cristi Landy, marketing director, Chevrolet Spark. "We hope Color Runners will like what they see when they meet the Spark." Color Runners has a nice ring to it, now doesn’t it? Something buyers of the first Chevy mini-car for the US and Canadian markets can identify with. The Chevy Spark that serves as the pace car for The Color Run events will have a paint job in keeping with the rainbow speckled appearance of participants at race’s end. It will sport a multicolored exterior with an interior featuring splashes of bright color throughout. "Our team wanted The Color Run Spark to look like an authentic race participant, and we believe this pace car will energize and inspire the crowd to take a closer look," said Kathy Sirvio, the General Motors senior design manager who worked on the production version of the Spark. The Race organizers select a charity in each city during the tour – this weekend, they will team up with the Police Unity Tour and Tuesday's Children, an organization committed to helping individuals affected by the 9/11 attacks of 2001. "We created the tag line 'The happiest 5K on the planet' when we saw how happy The Color Run made people; now the Chevrolet Spark's involvement is going to help us bring more happiness to runners and charity partners in more cities," said Travis Snyder, executive director for The Color Run. "We also love the fact that our events lead people to have a more healthy and active lifestyle." 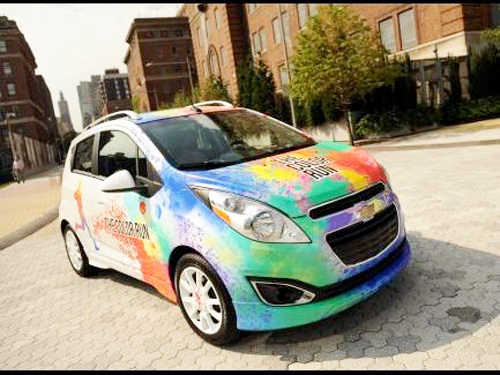 The multicolored Chevy Spark may be coming to a city near you as the event tours the country over the next year. The Color Run will be in Washington, D.C. on Sept. 9; in Portland, OR Sept. 29; in Miami on Oct. 21; at Houston Nov. 11; Orlando on Dec. 2; and St. Petersburg, FL on the ides of December, in addition to regional appearances and 2013 stops to be announce at a later date. If the Dead Heads weren’t nearing retirement age, they would all want this tie-dyed pace car and that’s for sure dude!